Citation: Michael T Deans (2018), Preventing Alzheimer’s Disease. Int J Ane & Rel. 2-2, 09-11. As a Cambridge undergraduate in 1967, I chanced to discover the recently corroborated ferroelectric phase transition in ice crystallised in liquid nitrogen. Graduating in Natural Sciences, I read an MSc in Biochemistry at UCL, trained as a Clinical Biochemist at the University of Surrey, programmed computers for 10 years, compiled a thesis Some consequences of a consistent framework for the origin of life at King’s College Medical School. Since its examiners refused it publication in 1988, I’ve conducted literature searches. Melrose Press published SCIENCE UNCOILED in 2016. My trace element studies1 account for most Western morbidity. Silicon hexafluoride serves as carrier for calcium phosphate for skeletal maintenance. Acid air pollution2 disrupting its synthesis explains Alzheimer’s Disease3. The stability of fluorspar, CaF2 aka Blue John illustrates the affinity of calcium for fluorine. Vitamin D3, 1,25-diOH-cholecalciferol stores ~265 nm UV light matching Si ~ F bond energy4. 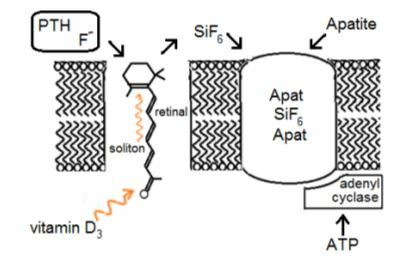 The conjugated single and double bonds of retinal transfer it through the cell membrane as solitons5 for SiF6= assembly. The parathyroid glands distribute fluoride in PTH6, c.f. adjacent thyroids packing iodine to thyroxine. Its continuous release ensures high fluoride concentrations don’t endanger the gland. SiF6= complexes with apatite7, Ca10(PO4)6(OH)2 or fluorapatite, Ca10(PO4)6F2 which tRNA analogues, transport DNAs, actively transport, Fig 1. I argue elsewhere that tDNAs8 are descendants of the first bioactive molecules, they share tRNAs’ H-bond-lined hole9, Fig 2. Embedded in cell membranes, membrane potential10 aligns them. Adenyl cyclase releases phosphodiester, Pi ~ Pi bond energy from ATP as ~4µ laser light. H-bonds absorbing this wave-length are depolarised and the residual electric field propels charged complexes through. is pH sensitive, its failure due to acidity arising at menopause or in kidney failure causes brittle bone disease, osteoporosis11. Associated pathologies include: vitamin D deficiency causing rickets12, F- deficiency explaining childhood tooth decay13 and excess F- resulting in mottled teeth14. A parallel reaction in plants yields their silica hard parts15, SOx/NOx acid air pollution entering their leaves inhibits it, causing leaf-fall16. Liming soils proved ineffective17, reducing interest in pollution control. If SOx/NOx air pollution causes inappropriate SiF6= synthesis in the nasal fossa, olfactory nerves transfer it to the brain. There its breakdown yields alumino-silicate plaques and fluoride. F- disrupts Krebs cycle18 causing progressive cell death and interferes with protein folding, creating β-amyloid and τ-protein tangles19,20. Mutant tRNAs substituting amino acids create similar tangles in Prion diseases21, embedded tRNAs render them infectious. Poor neurotransmission explains memory loss and related personality changes – the characteristic symptoms of Alzheimer’s Disease. The wife of a sufferer who preferred not to be named had reported temporary symptomatic relief four days after anaesthetic administration (presumably fluorinated). I observed in my father’s case following a hip transplant. The metabolic insult promotes renal F- excretion22 as AlF6Ξand simultaneous brain clearance of F-. The neural network model23 of brain function fails to explain the memory recall but it’s consistent with my minion-based account24. The age and distress of patients and their relatives obstruct investigation, anaesthetists liaising with psychiatrists might be test this proposal. Diesel exhaust25 abatement or a pharmaceutical vector introducing F- to the brain might prevent this consequence of careless exploitation of scarce resources. My father had a letter published in The Times newspaper26 concerning the danger of lead pollution from vehicle exhaust. Sussman, J. L. & Kim, S. 3D structure of a tRNA in two crystal forms. Science 192 853-58, (1976). Vogt, T. Presentation of environment statistics: Environmental data maps. (1986).